Tips, news, and techniques to help and inspire photographers. I can almost set my calendar based on the number of emails I receive regarding sensor dust. The hot, dry summer months, along with the increased use of cameras during vacation time adds up to dirty sensors. Factor in that most digital photographers have never cleaned their cameras' sensors and it is an undeniable truth that virtually every digital camera in use today has a significant amount of debris on its' sensor. Not your camera, you say? Trust me, if you have never cleaned your sensor, it's filthy - you just don't know it. And don't try the "But I never take the lens off..." line on me either. Camera systems are not hermetically sealed and all brands and models are prone to contamination when used regularly. Ironically, the bigger the sensor (and the higher the price tag) the more likely it will have dust. Most photographers don't realize that their sensors, or more accurately the anti-aliasing filter protecting the sensor, is dirty since the most commonly used f/stops are f/5.6 and f/8. At that aperture, the sensor does not fall within the depth of focus and the debris is not quite visible. However, once you start shooting at f/11 and smaller, it is likely you will observe some anomalies in areas that have consistent tonal values such as the sky. The question is: Do you send the camera in for cleaning (about $75 and two weeks down-time), or do you attempt it yourself? Frankly, it's not that tough. If you have the least bit of common sense, you can do this with the right materials. There are a number of reputable purveyors of sensor cleaning equipment and new technology is surfacing everyday. The latest tool, which saves a lot of time determining how dirty your sensor may be, is the Sensor Scope by Delkin devices. This is a magnified loupe with bright LED lights that allow you to view the sensor and any debris that maybe sitting on it. 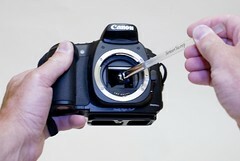 This first step is crucial since it makes no sense to clean a sensor that doesn't need it. If you decide to give it a go, I have written an in-depth sensor cleaning tutorial on how to proceed. It is listed in the Articles section of the Microsoft Pro Photo website under the "Color" tab and includes step-by-step instructions as well as list of resources for sensor cleaning supplies. These three sites cover virtually everything you need to know and buy for cleaning your own DSLR camera sensor. Unless you love spending hours using Photoshop to spot your images, invest thirty minutes and clean your camera. Microsoft is a major sponsor of Photoshop World (September 6-8 in Las Vegas) presented by the National Association of Photoshop Professionals. I will be hosting the Microsoft Theater at the Tech Expo where Icons of Imaging Peter Krogh and Colin Finlay, along with Tim Grey, will be presenting on Wednesday and Thursday. Check back here for the latest developments and news from the show. Any experience with Olympus dust-removing devices? Hey, I found an excellent solution for preventing sensor dust. the Koh Dustless Bag system. It has a HEPA air filtering unit that cleans out the air inside the bag. Hand ports make it easy to stick your hand in without contaminating the inner environment. Check out the website I ordered it from http://www.kohglobal.com The bag even functions as a Rain Cape as it has a third lens port. It has worked fantastically for me.